Thinking of great plot ideas is hard – otherwise everyone would be doing it! Even though it’s difficult, it’s not impossible, and if you want to write a story I’ve got some tricks to help you generate blockbuster high concept plot ideas. Classic thrillers always have plot ideas that can be described in a single sentence, and most of them have a great plot idea. When you think of your favourite novels what you’ll notice is that they have plot ideas that are paradoxical, because they are both obvious AND unusual (or at least they were when the book was written). That’s because they’re ‘high concept’ plot ideas. A high concept is a simple explanation of your novel that makes the attraction obvious. As soon as people hear the high concept they can decide whether that story is for them or not. The invention of the term High Concept is sometimes attributed to Michael Eisner, who was a creative executive at Paramount Studios and then CEO of Disney and responsible for movies like Raiders of the Lost Ark and The Lion King. He used high concept ideas to produce some of the most popular movies ever. First, a high concept idea helps you understand what your story is really about, what the essence of your novel is. That focus will help you write your novel. Second, it will make your novel easier to sell. If you’re going to sell your work to an agent or publisher, your concept has to grab them, or they will move on to the next submission without even reading it. If your concept is difficult to explain or understand, you will find it hard to get published. The best way to generate high concept plot ideas that are obvious but also unusual is to take something familiar and add a twist. Then the reader will see the obvious (the familiar story) and the unusual (the twist) The reader will understand that you’ve found a new and imaginative ways to tell classic stories. Authors often describe their work as a cross between two other authors. What would The Spy Who Came in From the Cold be like rewritten by Frederick Forsyth? How about The Thirty-Nine Steps sexed-up by Ian Fleming? A good way of coming up with off-the-wall plot ideas is to cross two seemingly disparate novels or movies with each other and see what happens. What would happen we crossed Zero Dark Thirty with The Day of the Jackal? How about if we mixed up Casino Royale with Our Man in Havana? This is a great way to find an obvious but also unusual idea. People have written so many stories that it’s impossible to come up with a fundamentally new idea, but moving the story to a new setting, or telling it from a new point of view can breathe new life into it. Who wouldn’t want to read The Hunt For Red October… in space? Could you make The Scarlet Pimpernel work if you set it during the Vietnam War? What about Rogue Male, but told from the point of view of the secret police, not the assassin? What’s in the news? What’s everyone talking about? At the time of writing, ‘whistleblowers’ like Edward Snowden are news. What kind of story does that suggest? Many people have said the story is reminiscent of classic John Le Carré novels like The Constant Gardener, but what if Tom Clancy wrote the story? This is where you let your imagination take over. Consider anything, history or current events perhaps, and ask yourself “what if all is not as it seems?” What if it’s a cover story? Read conspiracy theories on the internet. Some of them are incredibly imaginative. Get paranoid! Edward Snowden is really an American disinformation agent? Wikileaks is run by the Chinese Secret Service? The United Nations really is plotting to subjugate the USA? Well yes, they are, but that’s the point. Look at it this way: it’s brainstorming. Turn your inner critic off and just write those crazy ideas down – the crazier the better. Anyone can come up with an obvious idea! What if swans are actually alien spies? That’s unusual, but it’s not a concept that has obvious appeal. A good writer could make it work, maybe as a comedy, but probably not many people will want to read it, however good it is. A lot of the plot ideas you come up with are likely to be like that. 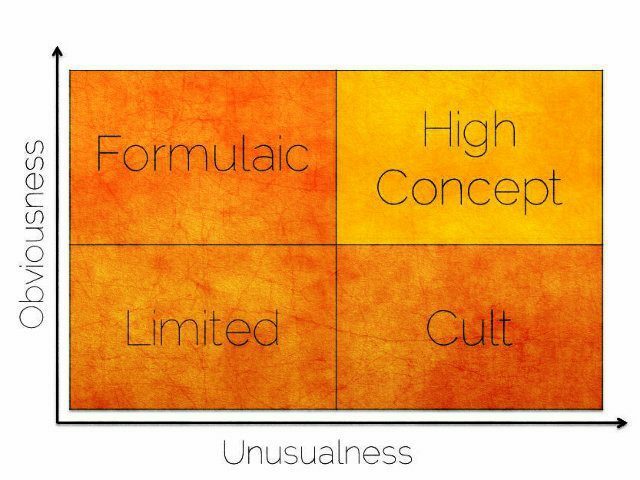 They would go in the Cult (unusual, but not obvious) box on the diagram. Maybe you can make them work, who knows? But the best thing is to keep brainstorming and putting crazy ideas together until one clicks and you think “actually that one might go places”. Now you need to make sure you can explain the concept as simply as possible, so that the attraction is obvious. The aim is to be able to tell people what your high concept is and they will say “I’d read that.” without any more explanation. So, make your high concept as short and simple as possible; imagine every word reduces your chance of success by 10%. I know it’s possible to use high concept to sell your novel because it happened to me. A British spy goes to Germany for revenge and discovers a doomsday weapon. Thirteen words. If each word cut my chance of success by 10% I would never sell my novel. Who cares that the spy is British, that could definitely be deleted. Revenge – OK that’s not bad, people like revenge thrillers. Discovers a doomsday weapon – what’s unusual about that in an espionage thriller? A spy seeks revenge against the Nazis. Well, it’s shorter, but it seems Formulaic (obvious but not unusual) and it’s still seven words (chance of success 30%). This works. It’s a “movie in a new setting” high concept and it’s only five words. When you read it you don’t know what the plot will be exactly, but you can have a pretty good guess about the kinds of things that will happen. Because it references James Bond there will probably be over-the-top action, a ‘Bond girl’ and an evil villain. That’s the obvious bit. The twist is the Nazis. How would a James Bond style hero fight the Nazis? That’s the unusual. When I was shortlisted for the Terry Pratchett Award I went to the prize-giving and tried my high concept on several publishing industry veterans. They all said “I’d read that.” My high concept idea worked! 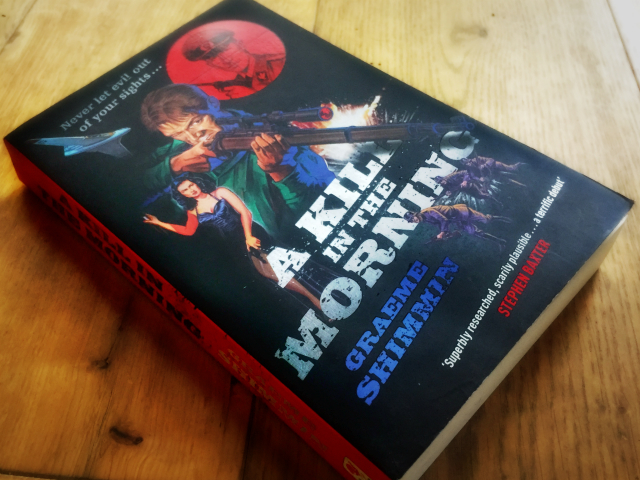 And now Penguin Random House, the biggest publishers in the world, have published A Kill in the Morning. Why we need a high concept spy novel plot idea. The keys to brainstorming that idea. How to hone the idea so it’s easily communicated. If you follow the process then you should find your own blockbuster high concept plot ideas. And once you’ve got it nailed, remember the High Concept is just the start, next you need to take that idea and turn it into an Unputdownable Plot. If you’d like to discuss your plot ideas, please email me. Otherwise, feel free to share the article using the buttons below.